What Kind of Lotion or Cream Can I Use on My Dog to Prevent Itching? If you've ever gotten a case of poison ivy, then you know how irritating and distracting a serious case of itchy skin can be. Many dogs will develop itchy skin at some point in their lives, and you'll want to get your dog some relief as quickly as possible. The good news is that there are many different lotions and creams you can use to treat your dog's itchy skin. With a little luck, you'll find the right anti-itch cream for dogs, bringing an end to her itchy skin. According to Lucky Puppy magazine, coconut oil can promote natural healing of your dog's itchy skin. Because coconut oil contains lauric acid and has many antiseptic and antifungal properties, it can be effective in battling various bacterial and fungal infections that may cause itchy skin. Coconut oil has very few side effects, so it's a fairly safe choice for dogs who have skin allergies. You can rub coconut oil onto your dog's irritated skin full strength. Lucky Puppy magazine notes that olive oil can also be effective as a dog lotion for dry skin. Olive oil contains omega-3 fatty acids, and these can help to reduce redness and flakiness while improving your dog's skin quality. To create a spray-on treatment for your dog's itchy skin, dilute five to 10 teaspoons of olive oil in purified water. Then, spray this mixture onto your dog's skin once per day. 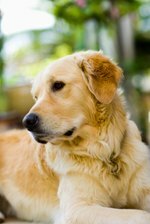 According to petMD, plain oatmeal can provide your dog with some relief from his itchy skin. Because oatmeal is nontoxic, it's an ideal topical treatment since your dog won't be harmed if he licks it off. You can grind plain oatmeal and combine it with water to make a paste, and then spread it onto your dog's skin. The oatmeal helps to dry moist, red skin, relieving the itching and helping your dog to feel better. You'll also find many shampoos and dog lotions for dry skin that contain oatmeal because of its soothing properties. Oatmeal shampoo can help to remove allergens like pollen that can get trapped in your dog's fur, further helping to relieve your dog's itching. PetMD explains that aloe vera can also help to soothe itchy skin and promote healing. If you use aloe vera for your dog, make sure that you purchase a lotion that doesn't contain alcohol, which can burn your dog's skin. If you have an aloe vera plant, you can harvest gel right at home to treat your dog. You can also buy aloe vera from most drugstores and grocery stores or order it online. Most topical treatments will give your dog temporary relief from itching, but if your dog is suffering from an allergy or a bacterial or fungal infection, she may need additional treatment to help her heal and truly bring an end to the issue. If your dog's itching continues on for weeks and you can't identify its cause, then it's time to schedule a visit with your vet. Your vet can help you try to determine just what's causing the itching and will probably start by taking a history on your dog and performing a skin scraping to look for signs of infection. In some cases, allergy testing may be needed if your vet suspects that an allergy is causing the issue. Once your vet can determine the cause, he may prescribe medications to treat the issue from the inside out while the topical lotions and creams help to relieve some of your dog's itchiness. In some cases, your vet may offer a prescription-strength cream to help treat your dog.